A suicide bomber apparently targeting a senior security official blew himself up inside a funeral tent, killing 18 people in the latest of a series of deadly attacks chipping away at the notion of a calmer Iraq. The U.S. military has repeatedly warned that the fight against insurgents is not over, and the bombing Monday in a village north of Baghdad was the third in as many days in Sunni Arab areas thought to have been largely rid of al Qaeda militants. There was no claim of responsibility for Monday's bombing in Hajaj, a village about midway along the nearly 20 miles between Saddam Hussein's hometown of Tikrit and the oil hub of Beiji, 155 miles north of Baghdad. But police said it bore the hallmarks of al Qaeda. Witnesses said about 70 people were inside the tent when the attacker set off his explosives soon after entering. 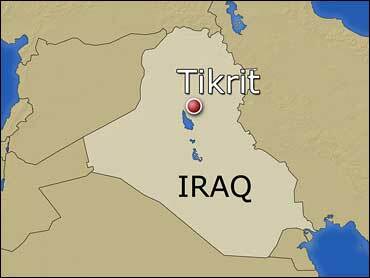 Officials said the target appeared to be Ahmed Abdullah, deputy governor in charge of security for Salahuddin province, of which Tikrit is the capital. He escaped unharmed. Abdullah was a relative of the man being honored at the funeral, Antar Mohammed Abed, a former bodyguard of Saddam's wife, Sajida Khairallah Tulfah, who became a farmer after returning to Hajaj following the ouster of the late dictator's regime five years ago. Abed's son and a grandson were among the 18 killed, said the officials, who spoke on condition of anonymity because they were not authorized to speak to the media. As a relative, Abdullah should have been sitting close to the son and grandson, since family members take the seats closest to the entrance on such occasions to be the first to receive visitors. Awad Jassim, a 25-year-old laborer hired by Abed's family to make tea and coffee for mourners, said he was only a few yards (meters) from the tent when the explosion ripped down the tent, sending him running for cover. "Later, I returned to the tent when I heard the voices of the wounded begging for help," he said. "There was chaos everywhere, but we managed to carry out the dead and the wounded." Khamis Safaa was waiting for food to be served inside the tent when the blast threw him off his chair. He was one of the 22 people wounded, suffering from shrapnel cuts on his abdomen and both legs. "I felt pain in most of my body and I was no longer capable of feeling my right leg," he said from his hospital bed in Tikrit. Policemen on duty outside the tent did not search visitors, said another witness, Mukhlis Salim, who lives nearby. He said he had paid his respects to Abed's family Sunday and rushed to the tent after the blast. "I saw blood, bits of flesh and clothes. People were screaming and asking for help," he said. The attack came one day after a teenage suicide bomber targeted U.S.-backed, anti-al Qaeda fighters near the former insurgent stronghold of Fallujah in Anbar province west of Baghdad. Six people were killed by that blast. On Saturday, three suicide bombers attacked a police station in Ramadi, Anbar's provincial capital. Guards killed one attacker, but the other two detonated their explosives at the entrance, killing at least five officers. Rear Adm. Gregory Smith, a U.S. military spokesman, told reporters Sunday that al Qaeda had been on the run after Sunni insurgents and clansmen joined with American troops in combatting the terrorist group. U.S. commanders credit anti-al Qaeda fighters from Sunni groups, a six-month cease-fire by a Shiite militia and the dispatch of 30,000 additional U.S. soldiers last year for a nationwide reduction in violence in recent months. But there has been an uptick in high-profile bombings in recent weeks, suggesting al Qaeda remains a potent threat despite the security gains. Briefing the U.N. Security Council on the downturn in bloodshed, the world body's envoy to Iraq said Monday urged all parties in the Iraqi government to maintain the positive momentum by bringing national reconciliation. Staffan de Mistura told the council that the Iraqi leadership "is signaling that it recognizes 2008 as the year to demonstrate its ability to administer a state that enjoys the broadest support and can deliver basic services and security guarantees." He said much depends on whether the government can enact key legislation and quickly provide economic benefits and essential services for the Iraqi people  electricity, water and sanitation. The U.S. military announced that a Marine was killed Saturday during fighting in Anbar, the first American combat death in that province since Oct. 8. Also on Saturday, a roadside bomb killed a U.S. soldier in the rural al Qaeda in Iraq stronghold of Arab Jabour south of Baghdad, the military said. In the capital Monday, hundreds of men carrying a huge Iraqi flag took part in the funeral of Jawad Abdul-Kadim, a suspected Shiite militia leader killed during a U.S.-Iraqi raid in western Baghdad. Protesters and relatives insisted he was not affiliated with any militant groups and was killed while trying to shield his wife. The U.S. military said only that an extremist brigade commander had been killed. It did not identify the dead man, but said he led a network of 10 groups in Baghdad that were implicated in murder, kidnappings and other criminal activity against Iraqi security forces and civilians.